Now Reading: How to feel like a Rajput princess! It was a time when beauty waged wars and sunk a 1000 ships. Kingdoms were invaded for the allure of princesses like Rani Padmavati . Grace and elegance of the Rajput queens shone far and wide, catching the attention of many a Mughal Prince. Love stories of opulence and passion were born. Their skin was said to have glowed like sandalwood, and their bejewelled, kohl-black hair shone, like mirrors. To possess beauty that had such a profound impact, the Rajputs paid very close atten-tion to care. The princesses used nature’s bounty of ingredients in elaborate ‘hair rituals’ that ensured tales were told of their tresses, many years to come. We uncover those lost rituals for you, here. 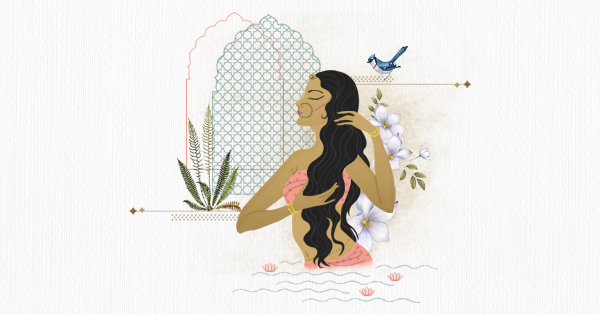 Despite being from the arid deserts of Rajasthan, the Rajput Queens swore by the coastal favourite, coconut oil, for their hair. After all, when you are Queen, you can have your favourite seed imported on bullock carts, even if it’s from the far-reaching the western coastal regions. Their ladies in waiting also added herbs like amla,to prevent greying, brahmi,-to makes hair thicker, and jatamansi,to promote hair growth, to their coconut oil, which was then carefully massaged into their crown-wearing scalps. When the desert heat got unbearable, they added grated doodhi (bottle gourd) to help cool their scalps. Then, the women of the palace would get together in the zenanas or royal baths for the hair wash ritual. They used natural cleansers like meth (also known as kaolin clay)- a snow white powder containing minerals and properties that absorb excess oil from your scalp. without robbing the hair of moisture. This also helped in gently exfoliating the scalp and stimulating hair growth. The clay was soaked in water overnight, and was mixed with lime juice the next morning. The maids scrubbed the Queen’s hair with the clay, as they sat on low silver stools, and then rinsed it off with hot water. Come Diwali, and the royals would indulge in a five-day pre-festival ritual, which included the utana or beauty bath. A host of ingredients were presented on silver trays, and the maids would rub the skin of the queens with different components to enhance it. For the hair, jasmine and other fragrant oils were used to add a sweet smell to the hair. The hair was finally washed off with shikakai and ritha, natural ingredients that were known to be effective hair cleansers while being gentle on hair. The women of the royal family took this ritual very seriously as they prepared for the festival. Wondering how to imbibe some of these royal rituals? 3. Add kaolin clay to your hair cleansing routine.